Over the last couple of years, screen-printing has become the skill in the DIY music scene elevating screenprinted posters beyond ‘mere’ advertising to desirable items in which fine art and marketing collide. Everybody knows somebody who can screenprint, and turns to them when it comes to producing professional but personal merchandise in bulk. Quite often this is done in attics, or on top of washing machines, with cardboard and window squeegees because of the cost of either hiring, or attempting to set up, a highly functioning studio. But more and more the DIY-ers are flocking to studio spaces, such as those at the Bluecoat, not only to learn new skills on courses and in workshops, but also just to rent the space, and with it, the technical equipment whose effects cannot be replicated in a kitchen. The Bluecoat has always had in the city’s collective consciousness a reputation not only for its ground-breaking exhibitions but also for cutting-edge cultural performance, the off-beat and the avant-garde: from Yoko Ono to Stravinksy, Captain Beefheart to Sun Ra. The building houses artists, writers, crafts-people, photographers and performers and offers a range of spaces for them to work, rehearse and socialize; both in public spaces and behind closed doors. Behind one of those doors is a place where the buildng’s rich artistic history and the musical obsession of its’ inhabitants collide. I might be biased because I work in the building, but I am constantly impressed with the Printing Studios, their output, the people who use them and the level to which screen-printing, in particular, is taking over the city. I don’t seem to be alone in this. The safe, non-toxic printing studios (which comprises both Screen Print and Etching), built and managed by the highly skilled artist and printmaker Emma Gregory, have welcomed all manner of local, national and international artists. Since opening in 2010, they have created quite a buzz amongst not only Liverpool’s illustrators and artists but also the local music scene, and those who produce their marketing materials and merchandise. Mike Snowdon, who has designed and printed work for FACT, The Coral and the Cultural Olympiad, spoke about why he always returns to the Bluecoat: “They have great facilities, which are well looked after by the print community. Emma Gregory’s help and advice have proven invaluable; she’ll always go the extra mile for you.” It is this mixture of professionalism and support, offered by the brilliant printmakers who run the studios, which make it a thriving, exciting space in which to work. Paul Rafferty, from the band Hot Club de Paris, has been using the studios for around a year, with his In The Room Print Co - a screen printing business specialising in both garment and paper stock printing, generally within the music, DIY and skateboarding world. The company produces music based merchandise not only all of their own material, but also for local bands, national artists and record companies (including Moshi-Moshi & Wichita Recordings). Amongst their clients are local boys Mugstar, Married to the Sea, Salem Rages and out of towners Slow Club and Frankie & the Heartstrings. In the Room are also responsible for the production of all of The Double Negative’s t-shirts (boasting designs submitted, and chosen by, the public) and tote bags. It is this mixture of professionalism and DIY which has seen the rise of screen printing as the most viable option for those wanting to create individual, high quality merchandise, which in turn has increased the demand for spaces like the studios at the Bluecoat. Jake Florek, from local brass and beat boys Stig Noise Sound System who used to produce band-related merch from a secret attic space, has recently taken to using the studio to print t-shirts for his band’s European tours as well as impressively psychedelic posters for local gigs. He uses the studios because he loves the people, the atmosphere and what is, compared to the stripped-down, punk operation he is used to, the “totally luxury studio gaff”. Mike Bennett, based at Breeze Studio Liverpool has also been using the studios for some time, and his business as an illustrator is dependent on the existence of the studio space, and the cost-effective equipment he has access to there. Ryan Fallon filmed a session of Mike printing up a new design in the Bluecoat studios, which shows how simple the practice is, using the right materials and with the right introduction to the process. This month, the Bluecoat’s screen studios’ relationship with the printers of the local music scene is celebrated by well-respected illustrator Gary McGarvey (professionally known as Horse), and the rest of the Screenadelica crew; later this week, as part of Liverpool Sound City, they are running two limited-place workshops at the Bluecoat, teaching people the basic skills needed to create unique, professional-looking gig posters. These workshops tie in with the Screenadelica exhibition, which originated in Liverpool two years ago, and has now travelled to Barcelona for Primavera Sound festival, SITE Gallery in Sheffield, Bestival on the Isle of Wight and Orlando Calling in Florida, and the exhibition, which this year ties in with both Light Night and Sound City, is the largest of its kind in the UK. Based at the Academy of Arts on Seel Street between the 17th-19th May, the exhibition will host work by over 20 different, international gig-poster artists, alongside an impressive line-up of live music, most of which comes from local bands, including Bow & Arrow, Forest Swords, Mind Mountain and Ex-Easter Island Head. 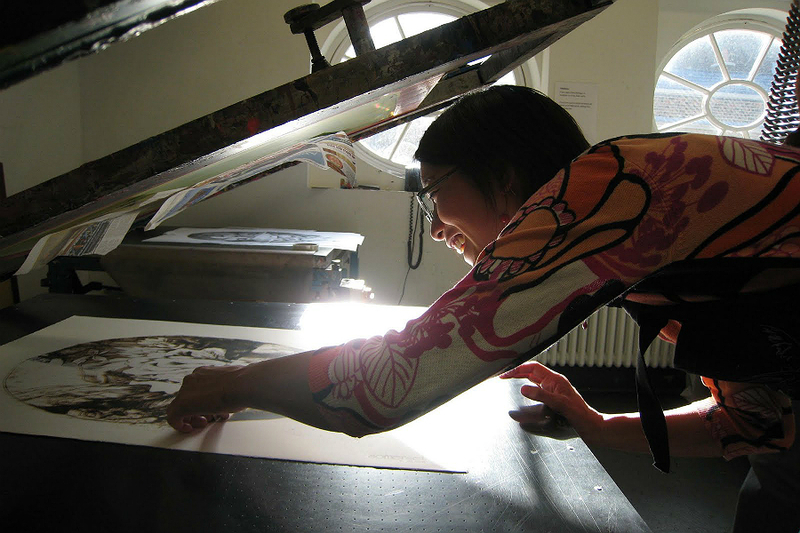 Also as part of Light Night, on May 18th, the Bluecoat will host free open studio sessions for both the Intaglio and Screen Printing studios, so that you can go experience printing for yourself, see the impressive and varied results of printing in the 20:20 exhibition, and take a look around the spaces and equipment used. Emma Gregory, along with several Print Technicians, will be on hand to teach the rudimentary techniques and some tricks which can be used to create the perfect gig poster, t-shirt or vinyl sleeve. These sessions will begin at 6pm and run throughout the evening, until 9pm.